Thread Check Inc. offers a full range of Gagemaker PD-8000 Series pitch diameter gages for straight external threads from 0″ to 72″ in diameter. Pitch diameter is the most important characteristic on a thread because it reflects the widest spectrum of possible defects. 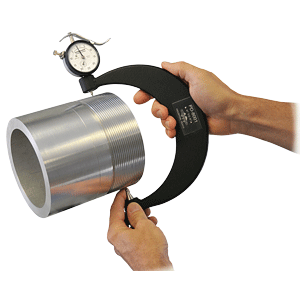 An out of tolerance pitch diameter can compromise the load capacity of a threaded component. Pitch diameter is also perhaps the most important element with regards to whether two parts will screw together. The effective diameter or P.D. is commonly ignored as long as the Go and No Go ring or plug gage passes the part. With Gagemaker PD-6000 and PD-8000 gages, the inspector has more control over the thread quality and assembly. The PD gage can determine exactly where the P.D. is at in relation to the Max. and Min. thread limits. The process of locating and measuring the pitch diameter takes less than a minute. This fast inspection can be the difference between running good parts or scrap. Pitch diameter is the distance from the pitch line to the corresponding pitch line located 180 degrees around. The Gagemaker PD-8000 Series gages are adjustable within a wide size range and use interchangeable contact points to measure different pitch threads. Setting dimensions for the PD gages are generated with the TDWIN Thread Disk software. Gages require setting with either a MIC TRAC™ or other means (i.e. gauge blocks, micrometer, standard, etc.). Software, MIC TRAC™, and contact points are sold separately. 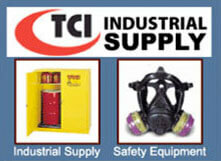 External PD-8000 Series gages can measure P.D. on straight thread diameters up to 72.00". Contact points are available for a range of threads and pitch sizes including UN series, Metric series, Acme, Stub Acme, 7x45 Buttress, and trapezoidal threads. 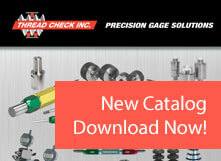 The Gagemaker PD-8000 Series pitch diameter gage are accurate, versatile, and economical. Gagemaker - 11" long PD-8000 extension arm, provides 8 diameter adjustment"